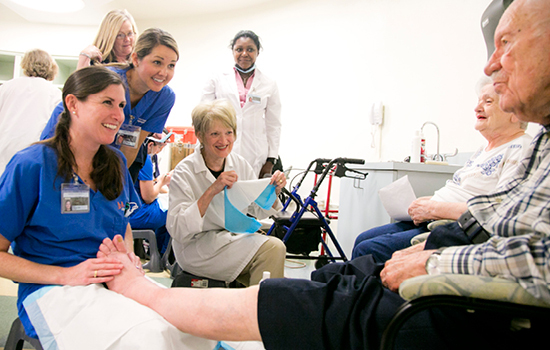 Dorothy Doughty (center) leads WOCNEC students during a foot and nail care clinic for seniors at Wesley Woods Towers. The students completed their classes online. Terry Klausner strives to keep life simple. It's the best way to balance her full-time roles as a nurse practitioner and mother of five children in Upstate New York. 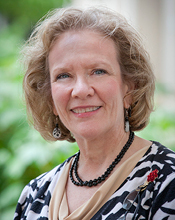 Given her schedule, a distance-learning program made sense when she enrolled in the Emory University Wound, Ostomy, and Continence Nursing Education Center (WOCNEC). Distance learning is one of three program options offered by WOCNEC, which moved from Emory's School of Medicine to the School of Nursing last fall. The nursing school is now home to one of the best continuing education (CE) programs of its kind in the nation with an annual enrollment of more than 250 nurses from the United States and abroad. Klausner learned about WOCNEC from her preceptor, an earlier graduate of the program. "I didn't miss out on anything," Klausner says of her online study. "The program offers volumes of information and pearls of wisdom on different techniques in wound, ostomy, and continence care. It's fabulous." She echoed the sentiments of 17 fellow classmates during the recent on-site portion of the distance-learning program known as bridge week. Students from California, Texas, Michigan, North Carolina, and other states came to Emory for hands-on instruction in WOC and foot and nail care. Students typically complete the online program in six to 12 months. WOCNEC is a postbaccalaureate degree certificate program for registered nurses who desire a specialty practice in wound care, ostomy care, and/or continence care. Emory's WOCNEC offers two other program options in addition to distance learning. Students in the traditional on-site program spend 10 weeks at Emory, where they receive six weeks of classroom instruction and four weeks of clinical instruction. Students who choose the split option take six weeks of classes at Emory and return home for four weeks of clinical instruction. Upon completion of the program, nurses are eligible for board certification through the Wound, Ostomy, and Continence Certification Board. Distance learning by far is the most popular option among students. WOCNEC is one of seven CE programs accredited by the Wound Ostomy and Continence Nurses Society in the United States and of which five offer an online option. "Ours is the only one that has a bridge week component," says WOCNEC director Rose Murphree, 11MN RN CWOCN CFCN. "We're known for working well with students." She credits her predecessors with the program's reputation. Among them is Dorothy Doughty 72MN RN CWOCN FNP FAAN, who directed WOCNEC for more than 30 years. Murphree was named director after Doughty retired this past spring. WOCNEC marks the nursing school's first online CE offering to help meet the demands of today's health care climate. "Patients in acute-care settings are sicker and have more issues," Murphree explains. "With shorter hospital stays, patients are being placed into home care or long-term acute care settings. These health care agencies need WOC nurses who are strong in promoting wound care, continence care, and ostomy care outcomes for these individuals across the health care continuum. Our program helps open doors for our graduates to fill this growing need in health care." An online course in foot and nail care is being added this summer. To learn more, visit nursing.emory.edu/WOCNEC.